The temperature outside is below negative 90 degrees Celsius. The authorities punish the rebels by exposing their bare arms to the cold until they freeze before hammering them to pieces. This is a scene from the movie, Snowpiercer, directed by Bong Jun-ho. The situation in the scene is so horrendous that it seems it can only belong in a fictional background. However, the fact is, Koreans had gone through a similar situation in real life, during the Japanese colonial period. In what the Japanese back then called as “medical experiments,” Japanese researchers froze Korean men in giant refrigerators and savaged their limbs to study frostbites. The dark days of our nation in which Koreans were exploited and tortured by the Japanese like in the case of “medical experiment” are already decades gone. Although Korean history textbooks and media talk constantly about the Japanese colonial era, young people of today are ignorant or only have a vague idea of the historical tragedy. According to a survey conducted by Hunet against 535 office workers, only 78.9 percent of the workers know the correct date of the National Liberation Day, which is August 15, 1945. Along with historical facts, people are devoid of sincere empathy towards their ancestors who had been tortured or had fought for the nation during the colonial period. Due to the fact that they had not experienced such hardships for themselves, there is a a gap between the hearts of youth today and those of the colonial times. Nevertheless, an online cartoonist, Lee Jae-cheol, with the pen name of Lee Mu-ki, attempts to fill this gap by retelling stories of the tragic history in his recent webtoon called Sheltered Child, currently serialized on Daum, a major Korean portal site. The story takes place in a small village called Pinangol, Jeolla Province of Korea, over the period of four years starting from 1939, giving a rather explicit view of the reality back then. 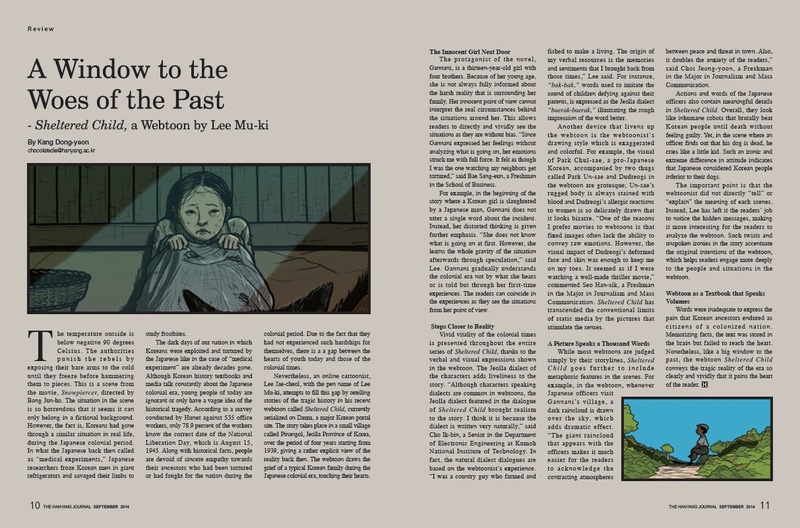 The webtoon draws the grief of a typical Korean family during the Japanese colonial era, touching their hearts. The protagonist of the novel,Gannani, is a thirteen-year-old girl with four brothers. Because of her young age, she is not always fully informed about the harsh reality that is surrounding her family. Her innocent point of view cannot interpret the real circumstances behind the situations around her. This allows readers to directly and vividly see the situations as they are without bias. “Since Gannani expressed her feelings without analyzing what is going on, her emotions struck me with full force. It felt as though I was the one watching my neighbors get tortured,” said Bae Sang-eun, a Freshman in the School of Business. For example, in the beginning of the story where a Korean girl is slaughtered by a Japanese man, Gannani does not utter a single word about the incident. Instead, her distorted thinking is given further emphasis. “She does not know what is going on at first. However, she learns the whole gravity of the situation afterwards through speculation,” said Lee. Gannani gradually understands the colonial era not by what she hears or is told but through her first-time experiences. The readers can coincide in the experiences as they see the situations from her point of view. Vivid vitality of the colonial times is presented throughout the entire series of Sheltered Child, thanks to the verbal and visual expressions shown in the webtoon. The Jeolla dialect of the characters adds liveliness to the story. “Although characters speaking dialects are common in webtoons, the Jeolla dialect featured in the dialogue of Sheltered Child brought realism to the story. I think it is because the dialect is written very naturally,” said Cho Ik-bin, a Senior in the Department of Electronic Engineering at Kumoh National Institute of Technology. In fact, the natural dialect dialogues are based on the webtoonist’s experience. “I was a country guy who farmed and fished to make a living. The origin of my verbal resources is the memories and sentiments that I brought back from those times,” Lee said. For instance, “bak-bak,” words used to imitate the sound of children defying against their parents, is expressed as the Jeolla dialect “baerak-baerak,” illustrating the rough impression of the word better. Another device that livens up the webtoon is the webtoonist’s drawing style which is exaggerated and colorful. For example, the visual of Park Chul-sae, a pro-Japanese Korean, accompanied by two thugs called Park Un-sae and Dudreogi in the webtoon are grotesque; Un-sae’s rugged body is always stained with blood and Dudreogi’s allergic reactions to women is so delicately drawn that it looks bizarre. “One of the reasons I prefer movies to webtoons is that fixed images often lack the ability to convey raw emotions. However, the visual impact of Dudreogi’s deformed face and skin was enough to keep me on my toes. It seemed as if I were watching a well-made thriller movie,” commented Seo Han-sik, a Freshman in the Major in Journalism and Mass Communication. Sheltered Child has transcended the conventional limits of static media by the pictures that stimulate the senses. While most webtoons are judged simply by their storylines, Sheltered Child goes further to include metaphoric features in the scenes. For example, in the webtoon, whenever Japanese officers visit Gannani’s village, a dark raincloud is drawn over the sky, which adds dramatic effect. “The giant raincloud that appears with the officers makes it much easier for the readers to acknowledge the contrasting atmospheres between peace and threat in town. Also, it doubles the anxiety of the readers,” said Choi Jeong-yoon, a Freshman in the Major in Journalism and Mass Communication. Actions and words of the Japanese officers also contain meaningful details in Sheltered Child. Overall, they look like inhumane robots that brutally beat Korean people until death without feeling guilty. Yet, in the scene where an officer finds out that his dog is dead, he cries like a little kid. Such an ironic and extreme difference in attitude indicates that Japanese considered Korean people inferior to their dogs. The important point is that the webtoonist did not directly “tell” or “explain” the meaning of each scenes. Instead, Lee has left it the readers’ job to notice the hidden messages, making it more interesting for the readers to analyze the webtoon. Such twists and unspoken ironies in the story accentuate the original intentions of the webtoon, which helps readers engage more deeply to the people and situations in the webtoon. Words were inadequate to express the pain that Korean ancestors endured as citizens of a colonized nation. Memorizing facts, the text was stored in the brain but failed to reach the heart. Nonetheless, like a big window to the past, the webtoon Sheltered Child conveys the tragic reality of the era so clearly and vividly that it pains the heart.